When last year's Young Reckless Hearts came out, I was a bit let down by Warm Soda. While there were certainly some good songs, I felt that there was something major missing from that record. I think it may have been the recording as the band just sounded zapped of their energy. I was hopeful it was an anomaly and things would be back on track with Warm Soda's third album, Symbolic Dream. Not only has Warm Soda righted course and improved upon their last album, Symbolic Dream is arguably the best record they have made yet. The punchy songs and smooth vocals have returned with some of the bands finest songs. From the first few seconds of album opener "I Wanna Know Her" you can tell that the band is on point. The album is littered with pop hits, great guitar leads and some simply wonderful choruses. I'm kind of over the whole splatter vinyl craze personally. I find that most of them just end up looking kind of ugly and have very little to do with the album artwork. You certainly cannot say that about the red and yellow ketchup and mustard split color vinyl of Symbolic Dream. Not only is it a cool looking take on a tired concept, but it perfectly matches the album art,so the band gets points for that as well. Everything about Symbolic Dream is an improvement from the last Warm Soda record. Its near flawless execution has shot it right up to the top of my favorite albums of the year list and is really only battling one other record at this point. 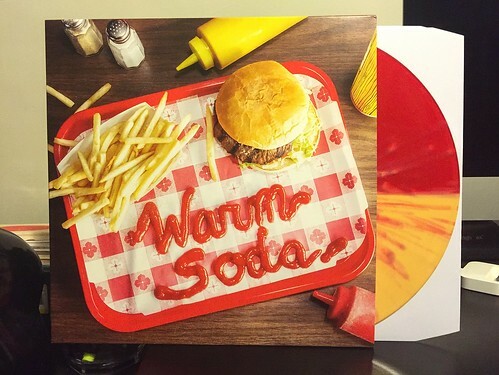 There's a lot of 2015 left to go, but rest assured this Warm Soda record will end up being one of the very best things you'll hear this year.